Whether you want to buy a gun, improve your shooting skills, or get a concealed carry permit, Shooter’s is your one-stop firearms shop in Columbia, IL. The friendly staff at this gun retailer understand every facet of gun ownership, including local laws and firearms training requirements. No matter if you’re just learning the ropes of gun ownership or are a more seasoned aficionado, this team is here to help with expertise. If you’re looking for a new firearm, Shooter’s carries an impressive selection of weapons that can fit your specific needs. While they specialize in vintage Smith & Wesson revolvers, their available products include a wide range of classic and modern pistols, revolvers, and rifles. To make purchasing even more convenient, this Columbia gun shop also offers in-state FFL transfers, fingerprinting, trades, and special orders. And if you already have a firearm, this team’s custom shop offers detailed cleaning and inspection as well as comprehensive repairs, adjustments, and fittings on your device. 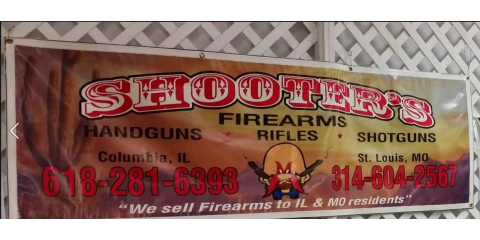 Shooter’s is also respected for its full-service indoor shooting range in Columbia, IL. Here, gun owners can practice target shooting safely and participate in exciting shooting competitions. If you need to learn more about your latest purchase, this team can provide firearms training that will have you leaving with confidence. And if you’re interested in a concealed carry permit, you can sign up for one of their affordable CCW classes that will help you meet all state requirements. To learn more about special discounts, firearm repair services, or sign up for a CCW course, visit this Columbia firearm resource online. If you have any questions about product selection, firearms training, or special orders, please call the Shooter’s staff directly at (618) 281-6393.